Brisbane Heat won the Big Bash League in 2012-13. 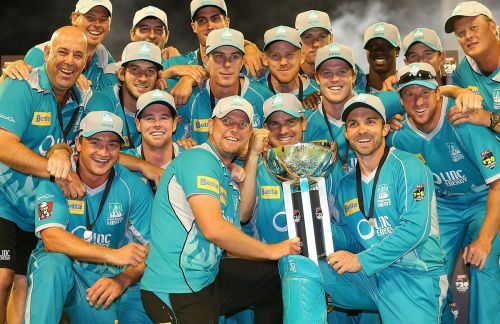 Brisbane Heat won the second edition of the Big Bash League back in 2012-13. Since then, they did not have a great run in the competition finishing in the bottom half of the table in the League Stages regularly barring in 2016-17 when they managed to reach the semi-finals. In that semi-finals, they were cruelly knocked out of the tournament when they lost the super over to the Sydney Sixers (both the teams were level at 167 at the end of 20 overs). If they manage to win the 2018-19 tournament they will become the only team after Perth Scorchers to win at least two BBL trophies. Time to take a look at their stats. 2012-13: Winners. Defeated Perth Scorchers in the finals. 209/3 against Hobart Hurricanes in December 2013 is their highest innings total. 73 all out against Sydney Sixers in January 2018 is their lowest innings total. 1560 runs scored by Chris Lynn is the most number of runs scored by a Brisbane Heat player. 112* by Luke Pomersbach against Melbourne Renegades in January 2013 is the highest individual score by a Brisbane Heat player. 2 centuries have been hit by Brisbane Heat players. These have been struck by Luke Pomersbach (112*) and Chris Lynn (101). 12 half-centuries scored by Chris Lynn is the most number of half-centuries struck by a Brisbane Heat player. 397 runs scored by Luke Pomersbach in the 2012-13 edition of the BBL is the most runs registered by a Brisbane Heat player in a single edition of the tournament. 40 wickets taken by Ben Cutting is the most wickets taken by a Brisbane Heat player. 5/22 by Samuel Badree against Melbourne Stars in January 2016 is the best individual bowling performance by a Brisbane Heat player. 18 wickets taken by Cameron Ganon in 2013-14 is the most number of wickets taken by a Brisbane Heat player in a single edition of the BBL. 19 dismissals (Ct - 11, St - 8) by Jimmy Peirson is the most number of dismissals by a Brisbane Heat wicket-keeper. 3 dismissals by Brendon McCullum against Sydney Thunder in January 2012 and by Craig Kieswetter against Melbourne Stars in January 2014 and against Adelaide Strikers in January 2014 is the most number of dismissals by a Brisbane Heat wicket-keeper in an innings. 9 dismissals (Ct - 7, St - 2) by Craig Kieswetter in 2013-14 is the most number of dismissals by a Brisbane Heat wicket-keeper in a single edition of the BBL. 16 catches taken by Ben Cutting is the most number of catches taken by a Brisbane Heat player. 3 catches taken by Nathan Hauritz against Adelaide Strikers in December 2012 and against Perth Scorchers in January 2013 and by Chris Lynn against Sydney Sixers in January 2014 is the most number of catches taken in an innings by a Brisbane Heat player. 9 catches taken by Nathan Hauritz in 2012-13 is the most number of catches taken by a Brisbane Heat player in a single edition of the BBL.